The record is made up of 1 volume (205 folios). It was created in 5 Aug 1935-28 Apr 1941. It was written in English and Arabic. The original is part of the British Library: India Office The department of the British Government to which the Government of India reported between 1858 and 1947. The successor to the Court of Directors. Records and Private Papers. 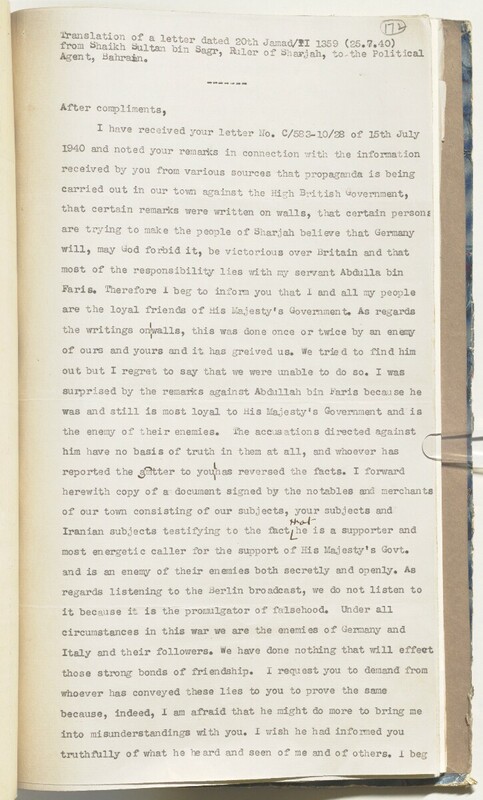 Anti-British activities of Abdullah bin Faris, Shaikh of Sharjah's Secretary. Calim [soldiers] of Makhoom bin Baroot against Shaikh of Sharjah. Dibah-Ras al Khaimah route to Trucial Coast The historic term used by the British to refer to the Gulf coast of Trucial Oman, now called United Arab Emirates. .
Persian Mission to the Trucial Coast The historic term used by the British to refer to the Gulf coast of Trucial Oman, now called United Arab Emirates. . The Visit of the Political Agent A mid-ranking political representative (equivalent to a Consul) from the diplomatic corps of the Government of India or one of its subordinate provincial governments, in charge of a Political Agency. , Bahrain, to Doha, Abu Dhabi and Dubai. Visit of the Political Resident A senior ranking political representative (equivalent to a Consul General) from the diplomatic corps of the Government of India or one of its subordinate provincial governments, in charge of a Political Residency. Persian Gulf Historically used by the British to refer to the sea area between the Arabian Peninsula and Iran. Often referred to as The Gulf or the Arabian Gulf. to the Trucial Coast The historic term used by the British to refer to the Gulf coast of Trucial Oman, now called United Arab Emirates. .
Relations between Ras al Khaimah and Muscat Government (Wadi al Qaur). Relations between Kalba and Muscat. Seizure of Persian jollyboat by Shaikh of Dubai. Shaikh of Abu Dhabi's visit to Basra for medical treatment. Shaikh of Dubai's letter to Persian Government. Smuggling of goods into Karachi. Visit of Persian Non Commissioned Officer to Dubai. The contents page lists the the topics covered in alpahabetical order although the entries are grouped into different parts of the volume. Foliation: The foliation sequence in use consists of a circled number located in the top right hand corner of the recto The front of a sheet of paper or leaf, often abbreviated to 'r'. of each folio. There is also a former system of foliation comprising of uncircled number.